We conducted a meta-analysis to evaluate the relationship between the glutathione S-transferase μ1 (GSTM1)– and glutathione S-transferase θ1 (GSTT1)– null genotypes and susceptibility to bladder cancer. We identified association reports from the databases of PubMed, Embase, the Cochrane Library and the China Biological Medicine Database (CBM disc) on July 1, 2017 and synthesized eligible investigations. Results were expressed using odds ratios (ORs) for dichotomous data, and we also calculated 95% confidence intervals (CIs). In this meta-analysis, we found that the GSTM1-null genotype was associated with bladder cancer risk in the overall population, and individually in whites, Africans and Asians (overall population: OR = 1.40, 95% CI: 1.31–1.48, P<0.00001; whites: OR = 1.39, 95% CI: 1.26–1.54, P<0.00001; Africans: OR = 1.54, 95% CI: 1.16–2.05, P = 0.003; Asians: OR = 1.45, 95% CI: 1.33–1.59, P<0.00001). The GSTT1-null genotype was associated with bladder cancer risk in the overall population, but not in whites, in Africans or Asians (overall population: OR = 1.11, 95% CI: 1.01–1.22, P = 0.03; whites: OR = 1.16, 95% CI: 0.99–1.36, P = 0.07; Africans: OR = 1.07, 95% CI: 0.65–1.76, P = 0.79; Asians: OR = 1.05, 95% CI: 0.91–1.22, P = 0.51). Interestingly, a dual-null GSTM1–GSTT1 genotype was associated with bladder cancer risk in the overall population and in Asians (overall population: OR = 1.48, 95% CI: 1.15–1.92, P = 0.002; Asians: OR = 1.62, 95% CI: 1.15–2.28, P = 0.006). In conclusion, the GSTM1-null, GSTT1-null and dual-null GSTM1–GSTT1 genotypes might be associated with the onset of bladder cancer, but additional genetic-epidemiological studies should be conducted to explore this association further. Bladder cancer, also known as urothelial cancer of the bladder, is the most common malignancy affecting the urinary system [1–3]. Treatment of bladder cancer has not advanced in the past 30 years . The disease has a multifactorial etiology that includes environmental factors such as cigarette smoking, arsenic exposure and occupational exposure as well as genetic factors [4–6]. Genetic factors are the one of the most important factors associated with the onset of bladder cancer . Smoking is a major risk factor for the development of this cancer, but the functional consequences of the carcinogens in tobacco smoke in terms of bladder cancer–associated metabolic changes remain poorly defined. Current evidence indicates that some gene polymorphisms are associated with bladder cancer morbidity [8–12]. Glutathione S-transferases (GSTs) play an important role in detoxification of various toxic compounds, such as carcinogens, and are a family of enzymes that include the glutathione S-transferase μ1 (GSTM1), θ1 (GSTT1) and π1 (GSTP1) classes, etc. . They are important phase II detoxifying enzymes that catalyze the conjugation of reduced glutathione (GSH) to hydrophobic, electrophilic xenobiotic substances . Genetic risk to malignant tumors has led to the accumulating attention to the investigations of genes polymorphism involved in process of carcinogenesis . The gene polymorphisms of GSTs might influence the detoxification activities of the enzymes, predisposing individuals to cancers, such as oral squamous-cell carcinoma, gynecological cancer, breast cancer, prostate cancer, hepatocellular carcinoma, and colorectal cancer [16–21]. In the past few decades, most of the epidemiological investigations have focused on the relationship between the null genotypes for GSTM1-GSTT1 and bladder cancer susceptibility. However, available evidence is inadequate due to the sparseness of data or disagreements among reported studies. We performed this meta-analysis to investigate whether the dual-null GSTM1-GSTT1 genotype was associated with bladder cancer susceptibility. We retrieved relevant published articles from the electronic databases of PubMed, Embase, the Cochrane Library and the China Biological Medicine Database (CBM-disc) on July 1, 2017, and we recruited eligible original articles for our meta-analysis. Key search terms consisted of [“glutathione S-transferases” OR “GSTs” OR “GSTM1” OR “GSTT1”] and [“bladder cancers” OR “bladder cancer”]. We identified additional articles through references cited in retrieved articles, and we also examined citations of retrieved articles and the previous meta-analyses. (1) The endpoint of each study had to be bladder cancers. (2) The study had to include 2 comparison groups (bladder cancers vs. controls). (3) The study had to provide detailed data on genotype distribution. (1) Case reports, review articles and editorials. (1) Preliminary results not focused on GSTM1, GSTT1 or outcome. (3) Investigating the relationship of GST gene expression to disease. (4) Multiple publications. To evaluate the quality of the recruited articles that met the above-listed inclusion criteria, we used a quality score based on 7 aspects of genetic-association studies (Additional file 1: Table S1). Thakkinstian et al. created the quality score form in 2005; its range spans from 0 (worst quality) to 12 (best quality). Two researchers who were responsible for literature retrieval appraised quality independent of one another, and a discussion was made until every respect was entirely consistent by comparison. Two investigators independently excerpted the following information from each eligible study: first author’s surname, year of publication, and number of cases and controls for both the GSTM1 and GSTT1 genotypes. We calculated frequencies for both the disease group and the control group from the corresponding genotype distribution. Finally, we compared the results and resolved any disagreements by discussion. We tested the consistency of the data extracted by the 2 researchers, and any disagreement was again resolved by discussion. We performed all statistical analyses using Cochrane Review Manager Software, version 5 (RevMan 5; Cochrane Library, UK). We used I2 to test heterogeneity among the included studies, and we counted the pooled statistic using a fixed-effects model (Cochran–Mantel–Haenszel method), but switched to a random-effects model (DerSimonian–Laird method) when the P-value of the heterogeneity test was < 0.1. Results were expressed with odds ratios (ORs) for dichotomous data, and we also calculated 95% confidence intervals (CIs). P < 0.05 was required for the pooled OR to be statistically significant. We graphically judged publication bias from the Begg adjusted-rank correlation test  and the Egger regression asymmetry test  using the Stata version 12.0 (Stata Corporation, College Station, TX), and P-values < 0.1 were considered significant. We included 72 studies [25–96], which contained 20,239 case series and 24,393 controls, in our assessment of the relationship between the GSTM1-null genotype and bladder cancer susceptibility (Fig. 1 and Table 1). We extracted data of interest: first author’s surname, year of publication and number of cases and controls for the GSTM1-null genotype (Table 1). Average distribution frequency of the GSTM1-null genotype was 56.15% in the bladder cancer group and 46.97% in the control group, indicating that the GSTM1-null genotype was higher in the bladder cancer cases than in the controls (case/control = 1.20). In the subgroup of patients and controls who smoked cigarettes, we included 24 studies [25, 30, 34, 35, 42, 43, 47, 48, 50, 51, 54–56, 64, 65, 68, 69, 73, 76, 83, 85, 91, 92, 95] (data not shown) containing 3724 case series and 3160 controls. Average distribution frequency of the GSTM1-null genotype was 55.67% in the bladder cancer group and 47.57% in the control group, indicating that the GSTM1-null genotype was significantly higher in the bladder cancer cases compared with the controls (case/control = 1.17). We included 61 studies [29, 32–34, 36–40, 42–45, 47–53, 55–61, 63–69, 72–74, 76, 77, 79, 83–86, 89, 91, 92, 95–108] containing 13,041 case series and 16,739 controls in our assessment of the relationship between the GSTT1-null genotype and bladder cancer risk (Fig. 1 and Table 2). Average distribution frequency of the GSTT1-null genotype was 29.58% in the bladder cancer group and 26.67% in the control group, indicating that the GSTT1 -null genotype was higher in the bladder cancer cases compared with the controls (case/control = 1.11). In the subgroup of patients and controls who smoked cigarettes, we included 21 studies [34, 42, 43, 47, 48, 50, 51, 55, 56, 64, 65, 68, 69, 73, 76, 83, 85, 91, 92, 95, 97] (data not shown) containing 3170 case series and 2793 controls. Average distribution frequency of the GSTT1-null genotype was 29.29% in the bladder cancer group and 28.65% in the control group-that is, similar in both groups (case/control = 1.02). We included 18 studies [32, 37, 39, 43, 47, 48, 52, 55, 58, 60, 63, 65, 67, 79, 84, 85, 89, 96] containing 2426 case series and 3874 controls in our assessment of the relationship between the dual-null GSTM1-GSTT1 genotype and bladder cancer risk (Fig. 1 and Table 3). Average distribution frequency of the dual-null GSTM1-GSTT1 genotype was 16.78% in the bladder cancer group and 11.45% in the control group. Therefore, the dual-null GSTM1-GSTT1 genotype was significantly higher in the bladder cancer cases compared with the controls (case/control = 1.47). 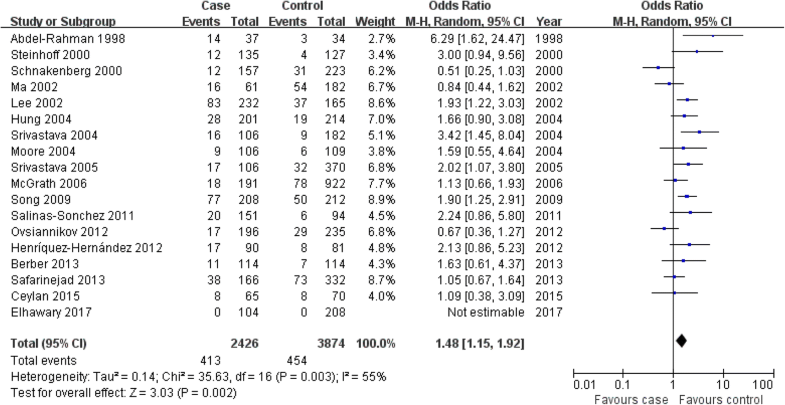 In this meta-analysis, we found that the GSTM1-null genotype was associated with bladder cancer risk in the overall population, and individually in whites, Africans and Asians (overall population: OR = 1.40, 95% CI: 1.31–1.48, P<0.00001; whites: OR = 1.39, 95% CI: 1.26–1.54, P<0.00001; Africans: OR = 1.54, 95% CI: 1.16–2.05, P = 0.003; Asians: OR = 1.45, 95% CI: 1.33–1.59, P<0.00001); as well as in controls from both hospital-based and population-based studies that included both high- and low-quality studies (Fig. 2 for the overall population; Table 4). In the meta-analysis for all patients and controls who smoked cigarettes, we found that the GSTM1-null genotype was associated with bladder cancer risk in the overall population, Asians and controls from both hospital-based and population-based studies that included both high- and low-quality studies. However, we did not find this relationship in whites or Africans (Table 4). In this study, we found that the GSTT1-null genotype was associated with bladder cancer risk in the overall population, and controls from hospital-based studies that included high-quality studies; but not with bladder cancer risk in whites, Africans, Asians or controls from population-based studies that included low-quality studies (overall population: OR = 1.11, 95% CI: 1.01–1.22, P = 0.03; whites: OR = 1.16, 95% CI: 0.99–1.36, P = 0.07; Africans: OR = 1.07, 95% CI: 0.65–1.76, P = 0.79; Asians: OR = 1.05, 95% CI: 0.91–1.22, P = 0.51; Fig. 3 for overall population; Table 4). 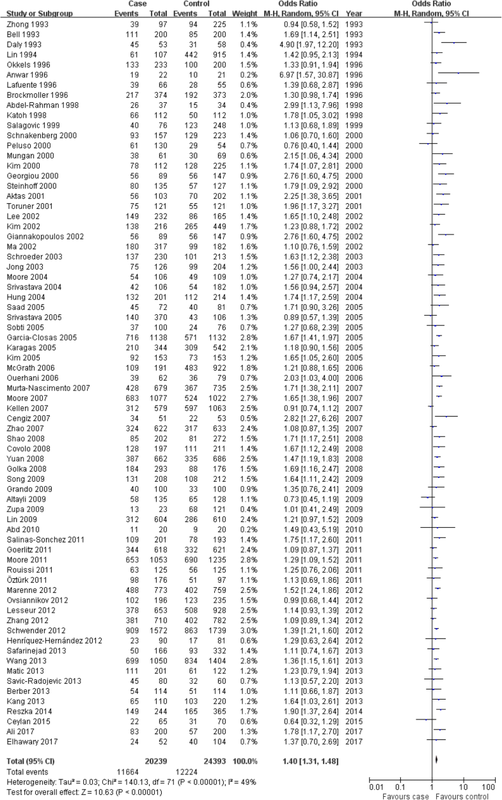 However, in controls from either hospital-based or population-based studies that included both high- and low-quality studies, or in the meta-analysis for all patients and controls who smoked cigarettes, we found that the GSTT1-null genotype was not associated with bladder cancer risk in the overall population, or in individual white, African or Asian populations (Table 4). We found an association between the dual-null GSTM1-GSTT1 genotype and bladder cancer risk in the overall population, Asians and controls from hospital-based studies that included high-quality studies (overall population: OR = 1.48, 95% CI: 1.15–1.92, P = 0.002; Asians: OR = 1.62, 95% CI: 1.15–2.28, P = 0.006; Fig. 4 for overall population; Table 4). However, the dual-null GSTM1-GSTT1 genotype was not associated with onset of bladder cancer in whites or in controls from population-based studies that included low-quality studies (whites: OR = 1.30, 95% CI: 0.83–2.03, P = 0.25; Table 4). We performed a publication bias test for the association of the GSTM1-null, GSTT1-null and dual-null GSTM1-GSTT1 genotypes with bladder cancer risk in the overall population. There was no bias for the association of the dual-null GSTM1-GSTT1 genotype with bladder cancer risk, but there was for the GSTM1- and GSTT1-null genotypes (GSTM1-null: Begg P = 0.100, Egger P = 0.052; GSTT1-null: Begg P = 0.001, Egger P = 0.002; dual-null GSTM1–GSTT1: Begg P = 0.343, Egger P = 0.236; Fig. 5). Research on single-nucleotide polymorphisms have focused mainly on their impact on tumor suppressor genes, metabolic-enzyme genes, and DNA repair genes, etc. Understanding disease susceptibility and pathogenesis and using them to guide diagnosis and individual treatment choice constitute an important new therapeutic approach . In this study, we found that the average distribution frequency of the GSTM1-null genotype was significantly higher in bladder cancer cases than in controls (case/control = 1.20). In the subgroup of patients and controls who smoked cigarettes, it was also higher in the bladder cancer case group compared with the control group (case/control = 1.17). This might indicate that the GSTM1-null genotype was associated with bladder cancer risk in the overall population, including whites, Africans, Asians, and controls from both hospital-based and population-based studies that included both high- and low-quality studies. In the meta-analysis for all patients and controls who smoked cigarettes, we found that the GSTM1-null genotype was associated with bladder cancer risk in the overall population, Asians, and controls from both hospital-based and population-based studies that included both high- and low-quality studies. The sample size of our meta-analysis was larger than those of other meta-analyses [61, 110–112], and therefore our results might be more robust. However, our tests for publication bias, the GSTM1 studies were found to be positive. Therefore, the positive association between the GSTM1-null genotype and bladder cancer should be reassessed in the future. The average distribution frequency of the GSTT1-null genotype was higher in the bladder cancer case group than in the control group (case/control = 1.11). In the subgroup of patients and controls who smoked cigarettes, it was similar in both groups (case/control = 1.02). This might tell us that the GSTT1-null genotype was associated with bladder cancer risk. For confirmation, we performed a meta-analysis, which further showed the GSTT1-null genotype to be associated with bladder cancer risk in the overall population, whites and controls from hospital-based studies that included high-quality studies. In the meta-analysis for all patients and controls who smoked cigarettes, we found that the GSTT1-null genotype was not associated with bladder cancer risk in the overall population, whites, Africans, Asians or controls from both hospital-based and population-based studies that included both high- and low-quality studies. Our results indicate that the GSTT1-null genotype does not predict the risk of bladder cancer. The sample size of our meta-analysis was larger than those of other meta-analyses [111, 112], suggesting that our conclusion might be more robust. However, publication bias was also found for GSTT1. Therefore, further studies are required. Average distribution frequency of the dual-null GSTM1-GSTT1 genotype in the bladder cancer group was slightly higher than in the control group (case/control = 1.47), indicating a possible association between the dual-null GSTM1-GSTT1 genotype and bladder cancer risk. Meta-analysis further revealed an association between the dual-null GSTM1-GSTT1 genotype and bladder cancer risk in the overall population, Asians and controls from hospital-based studies that included high-quality studies. 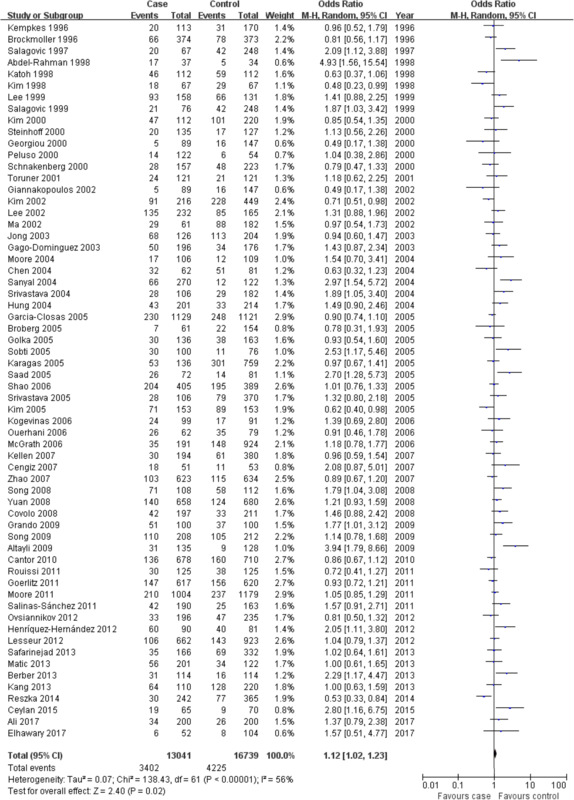 No publication bias was found for this meta-analysis, and the conclusion was robust. In a previous study, García-Closas et al. conducted a meta-analysis of 28 studies of GSTM1 and reported that the GSTM1-null genotype both increased the overall risk of bladder cancer and posed similar relative risks for both smokers and non-smokers. This finding suggested that GSTM1 lowers the risk of bladder cancer through mechanisms that are not specific to the detoxification of polycyclic aromatic hydrocarbons in tobacco smoke. Engel et al. 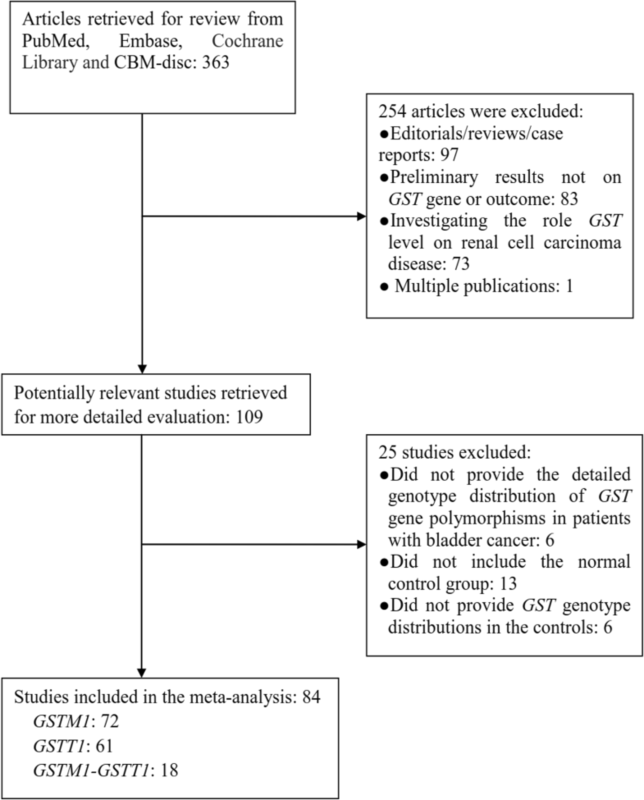 performed a meta-analysis of GSTM1 and bladder cancer that included 17 studies and reported that the GSTM1-null status is associated with a modest increase in the risk of bladder cancer, and that there was no evidence of multiplicative interaction between the GSTM1-null genotype and once and current smoking in relation to bladder cancer. A meta-analysis by Yu et al. included 48 case–control studies for GSTM1-null and 57 studies for GSTT1, and suggested that the GSTM1- and GSTT1-null genotypes might both be related to higher bladder cancer risk. Yu et al. also performed a meta-analysis to investigate the association between GSTM1-GSTT1 deletion polymorphisms and bladder cancer susceptibility, including 46 studies of GSTM1-null, 54 of GSTT1 and 10 of dual-null GSTM1-GSTT1. All 3 genotypes were associated with increased bladder cancer risk. In our meta-analysis, we included 72 studies for GSTM1-null, 62 for GSTT1-null and 18 for dual-null GSTM1-GSTT1 genotypes. These results from the meta-analyses mentioned above were similar to our results. However, the sample size of our meta-analysis was larger than the previous meta-analyses, and the results from our studies might be more robust. Furthermore, we initially conducted a meta-analysis that showed no evidence of multiplicative interaction between the GSTT1-null genotype and smoking in relation to bladder cancer. Smoking is a known risk factor for bladder cancer , and the products of GSTs help detoxify the polycyclic aromatic hydrocarbons found in tobacco smoke . Our study suggests that the GSTM1-null genotype might play a role in such detoxification, but the GSTT1-null genotype does not. However, more studies should be conducted to confirm this. GSTM1-null, GSTT1-null and dual-null GSTM1-GSTT1 genotypes play an important role in detoxification of various toxic compounds, such as carcinogens. In this meta-analysis, it indicated that GSTM1-null, GSTT1-null and dual-null GSTM1-GSTT1 genotypes were risk factors to susceptibility of bladder cancer, and took part in the pathogenesis of bladder cancer. There were limitations in our meta-analysis. First, age might be a source of heterogeneity, but it was difficult to stratify the different ages in the reports prior to pooling the results, for the reason that the ages from most of the included studies were different. So, no conclusions can be drawn regarding the impact of GSTs on age of onset. Furthermore, heterogeneity and publication bias were both significant for GSTM1-null and GSTT1-null. Subgroup analyses were performed to find out any effect modifier, but the reason was not clear. Our results supported that the GSTM1-null, GSTT1-null and dual-null GSTM1–GSTT1 genotypes might be associated with the onset of bladder cancers. However, more association investigations are required to further clarify these relationships. Tianbiao Zhou and Hongyan Li contributed equally to this work. This study was supported by Guangzhou Medical Key Discipline Construction Project. The funding paid the publication fee for this paper. TBZ was in charge of conceived and designed the study. TBZ, HYL, WJX, ZQZ, HZZ were responsible for collection of data and performing the statistical analysis and manuscript preparation. TBZ and ZJL were responsible for checking the data. All authors were responsible for drafting the manuscript, read and approved the final version.